Russian media reports that Jordan is consulting with Moscow on buying a batch of Su-32s, a export derivative of Russia’s Su-34 Fullback fighter-bomber, which itself is an evolution of the Su-27 Flanker series of fighter aircraft. 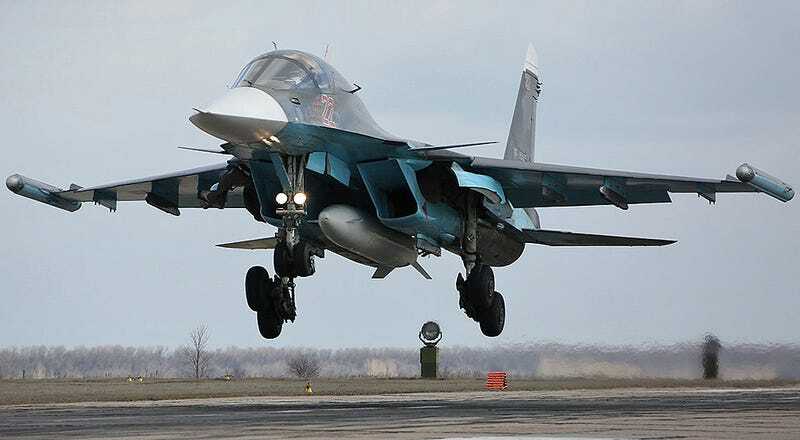 Russia’s Su-34s were largely the stars of their bombing campaign in Syria and have since found their first export customer in the Algerian Air Force. Yet introducing a top tier Russia fighter-bomber into Jordan’s air arm, a flying service that has been entirely dominated by western fighters since its founding, would be a huge change of course for Amman. The fast-jet side of the Royal Jordanian Air Force is made up exclusively of F-16 and F-5s, both of American origin. Before that French Mirage and British Hunters filled its ranks. With this in mind, not only would such a purchase be a change militarily for Jordan, it would also be a change geopolitically to a certain degree. There has been quiet tension between Amman and the White House over the level of support Jordan has received when it comes to the fight against ISIS. Following the horrific execution via burning of a captured Jordanian F-16 fighter pilot, Jordan’s King Abdullah went to Washington prepared to go all in with his forces against ISIS if the US could support his plans.It is clear that the White House has not met Jordan’s requests for support. Shortly after Jordan’s reprisal air campaign for their F-16s pilot’s death kicked off, their jets were seen loaded with dumb bombs, with many lacking the expensive targeting pods needed to guide precision guided munitions onto their targets. Now Jordan’s fight against ISIS, especially their air campaign, is nowhere near what they originally proposed. In fact, by all accounts it barely exists. As a result, it is possible that Jordan is looking to diversify its global partnerships, and Moscow is always eager to step in where Washington has stepped away. Shifts in what had once been clear military trade alliances are an increasingly reality in the region. Egypt, although not as foreign to Russian military aircraft as Jordan, has also moved out of America’s orbit when it comes to importing high-end military aircraft. This move has come following the crash in US-Egypt relations following the military coup that ousted the democratically elected Muslim Brotherhood. Now the hard-line el-Sisi government has found a close friend in Moscow. As a result they have ordered dozens of advanced MiG-29s and Ka-52 attack helicopters among other expensive gear, instead of American designs. Other Arab countries have also been frustrated with the White House over their tight reigns on exporting high-end military hardware, namely fighter jets. Kuwait and Qatar have been forced to turn to European manufacturers for their defense needs, a move that will impact the future of both the F-15 and F/A-18 production lines negatively. Then there is the question as to why Jordan needs the Su-34/32s at all. These aircraft have a larger combat radius than the F-16 by a large margin, closely akin the to that of the F-15E. What target sets are needed for such range? Is Jordan looking to expand its military reach further than ever before? There is also the issue of these aircraft being completely uncommon with Jordan’s upgraded F-16s. Even the weapons they employ are totally dissimilar. Seeing as Jordan clearly has a hard time outfitting all their F-16s with enough targeting pods and precision guided weapons, how can they afford a new heavy fighter-bomber with its own set of weapons and support requirements? We will have to wait to see how this story unfolds, although it remains doubtful that Su-32 will show up with Royal Jordanian Air Force rouduels on their tails, although it is is possible. This is especially true if Moscow makes Jordan a deal on these jets and their weapons that Jordan simply cannot refuse. If Su-32s do end up flying for the Royal Jordanian Air Force then it will mean more than just a new weapon in the region. It will highlight Russia’s growing and Washington’s decreasing influence in an increasingly complicated region.